The importance of quickly tracking down signals that may be used for disruptive, illegal purposes has grown significantly in recent years. Finding and physically locating RF emitters that are misusing the radio spectrum can be a challenging process, especially when risk mitigation and time to response are critical. The Tektronix H600 RFHawk lets you quickly scan the RF environment, classify known signals and easily locate unknown signals. It is a handheld rugged, battery operated RF signal hunter with an intuitive set of field signal hunter tools that are matched to the task. It allows for quick scanning of the RF environment, simple, reliable classification of legitimate signals for exclusion and gives field-proven signal hunting, mapping and documentation tools. The RFHawk has surveillance grade hardware featuring an outstanding noise figure and sophisticated tools necessary to rapidly scan, classify and locate illegitimate analog and digital RF transmission sources in the field. 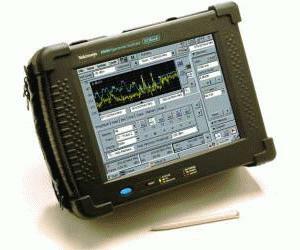 The RFHawk Spectrum Analyzer offers a user interface designed for field conditions with previously unreached performance in a battery-operated field unit. The input frequency range of 10 kHz to 6.2 GHz covers most modern signal sources. It has an unsurpassed ability to detect very low level signals with -153 dBm DANL at 10 Hz RBW. The RFHawk matches signals to known standards using frequency, bandwidth, and other criteria. An expert system help with on-screen profile masks for quick frequency offset estimations is included, allowing easy database upgrades. The RFHawk also examines a cyclo-stationary make-up of a given signal to look for specific cyclic components. The RFHawk hunts outdoor signals by plotting measurements directly into GPS-integrated geo-referenced maps. In-building signals can be entered with a Tap-and-Walk-and-Tap interface. There is no need to return to the office for the analysis of difficult problems.